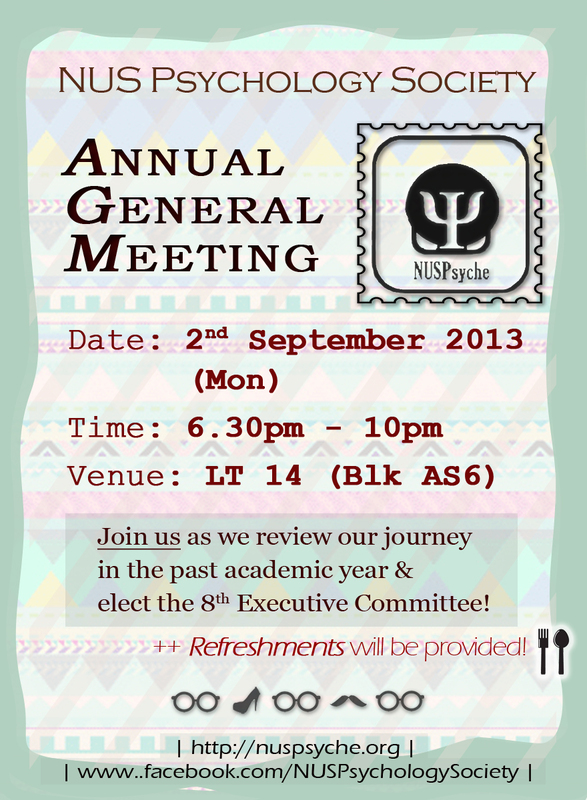 We will be holding our 8th Annual General Meeting on 2 September 2013. As such, we cordially invite you to join us in this special event as part of the NUSPsyche family! https://docs.google.com/a/nuspsyche.org/forms/d/1sruAgnA6nsdqM2unow9aBw0ZSpuRZ5cgg53LlekAqr0/viewform by 31st August 2013, Saturday. Interested in learning about leadership and teamwork? Having thoughts about taking a leadership position? Thinking of running for a position in our 8th Executive Committee, but unsure and feeling unprepared? 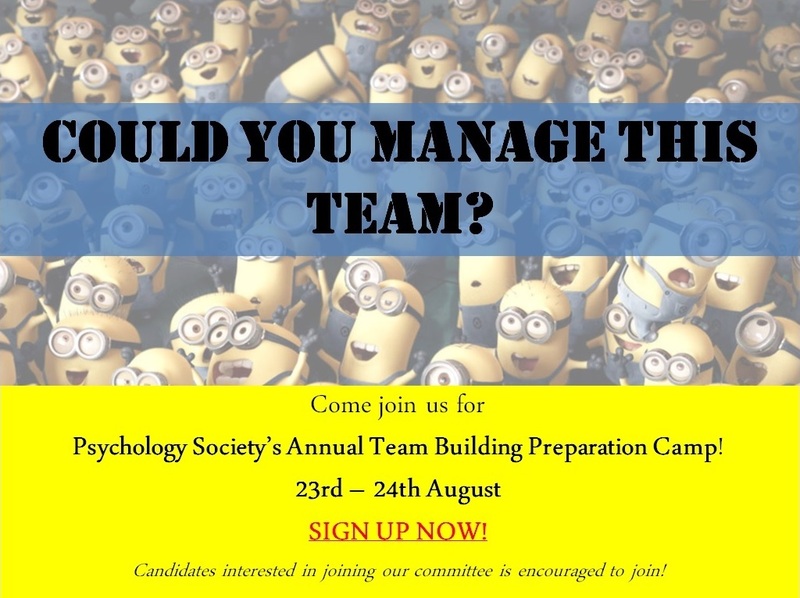 NUS Psychology Society will be holding our annual Preparation Camp open for any student who is interested in learning about leadership skills, team building and cooperative skills. If you are contemplating running for our 8th Executive Committee or just want to find out more, you are most welcome to join us for the PREP CAMP! This camp not only aims to impart the skills involved in a leadership role, it also serves as a platform to know more about our society as well as to make more friends too! Sign up for the chance to learn and socialize! Sign up here if you are interested in participating. Deadline to sign up is 22nd August 2013 Thursday 2359hrs. More details will be given on Friday morning after the sign ups have been finalized. *Please take note that it is not compulsory for students who are interested in running for the 8th Executive Committee of NUS Psychology Society to sign up but you are strongly encouraged to take up this chance learn about leadership and team building skills as well as to know your future committee members! Looking forward to see you at the preparation camp! RSVP TODAY @ http://bit.ly/16o1S7o and join us at our Welcome Tea! Thank you for your support for Psychology Society in AY2012/2013! It has come to the time when the 7th NUSPsyche Executive Committee will step down and the 8th Executive Committee step up to serve all of you. 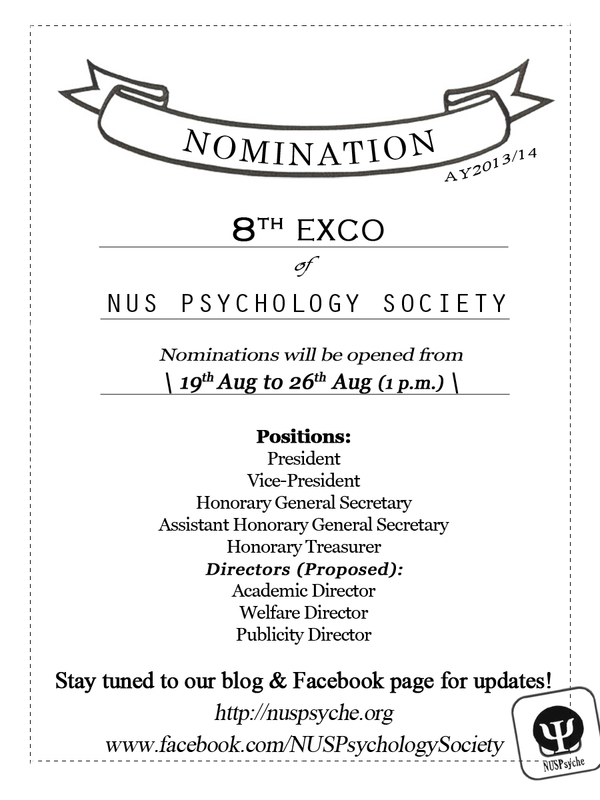 From 19 August (Friday) to 26 August 2013 (Monday),1300 hrs, nominations for the 8th ExCo will be open. If you have someone in mind to nominate, or would like to step up and nominate yourself, please download the nomination form, fill it in, and submit it to the NUS Psychology Society Mailbox, located at Psychology Department AS4 Level 2 (together with the Professors’ mailboxes), anytime during the nomination period. Please note that the link to download the nomination forms will only be released during the nomination period. The link will be released via our website, mailing list and facebook page. All nominations will require a seconder (preferably from the 7th Executive Committee) and to be submitted in hardcopy to our Psychology Mailbox together with a digital photo online. Details of submission can be found on the nomination forms itself. 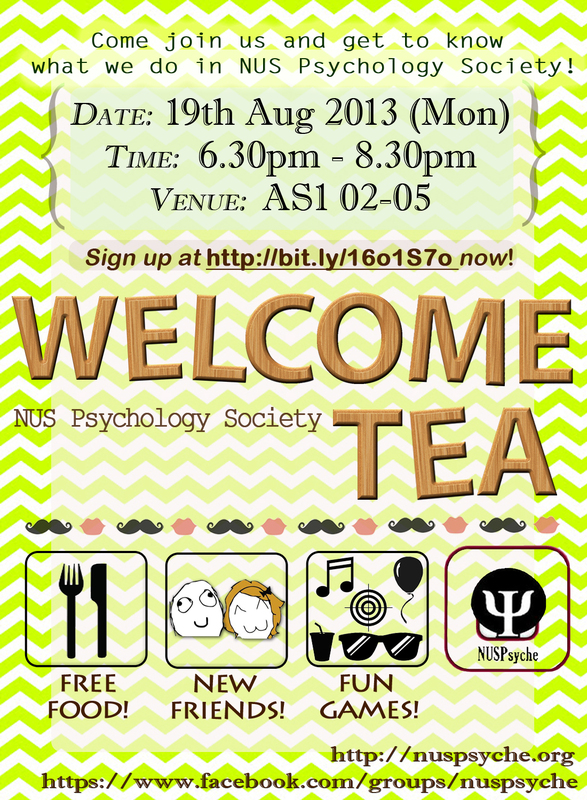 NUS Psychology Society will be having our Recruitment Drive during the first week of school! We also provide a platform for you to meet more fellow Psychology majors. Members are entitled to privileges such as receiving first-hand information of our upcoming events and getting priority/FREE admission to our selected events! You can sign up as a lifetime member of Psychology Society at only $5. 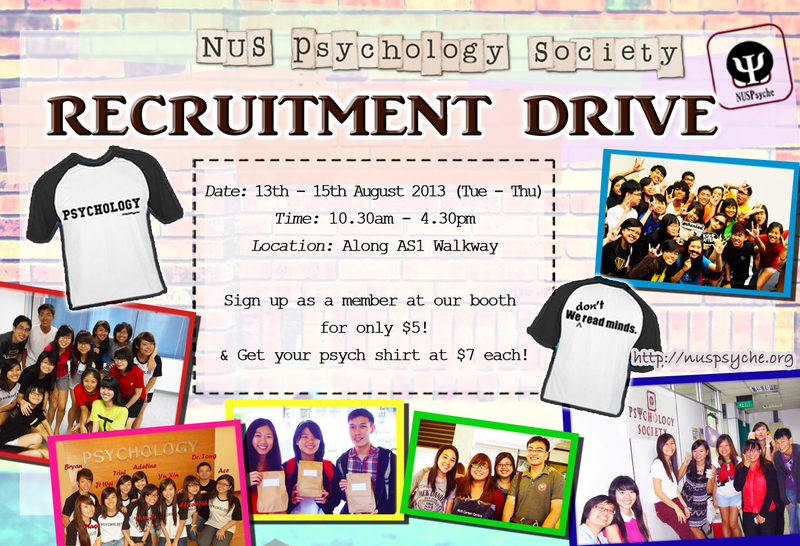 We will also be selling our Psychology shirts during the Recruitment Drive! Drop by our booth to purchase your own Psychology shirt at only $7 (while stocks last)! 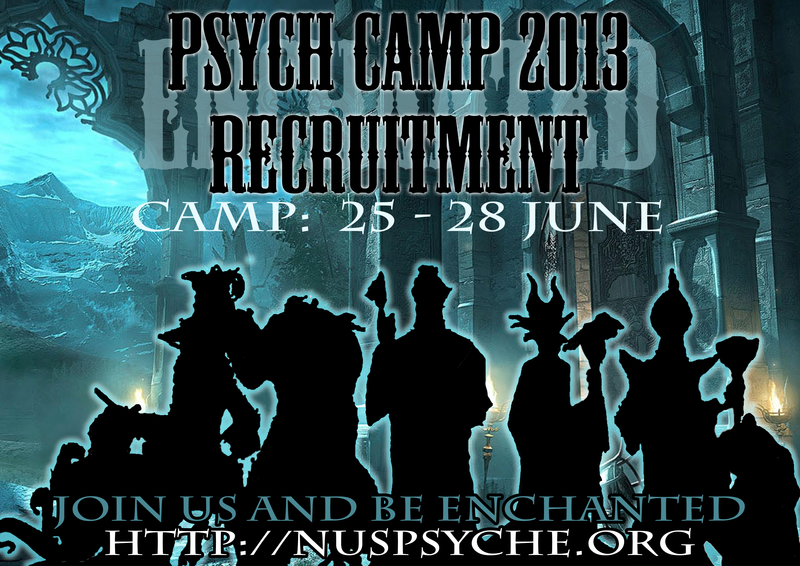 NUS Psychology Camp 2013 is open for registration! or facebook page at http://www.facebook.com/psychcamp2013.